For many years it seemed like this day would never come — the day that we would be free to wander around the country in an RV and a pickup truck and choose our next destination with a random finger stab at the map lying in our laps. But the day did come, not by accident but by sheer determination and hard work. There were hard choices. Six years ago we were living on a retired 30-acre Christmas tree farm with too much mowing to do… and a mortgage we could no longer afford. Our kids had all grown up and left our spacious rural estate and our large house, and our nearest grandchild now lived 80 miles away. We had become weary of the upkeep on so much property and wanted to see the world — and our grandkids. But we couldn’t afford it. I had been running a full crew with my log home construction company when the housing bust arrived in Michigan — two years before the recession. It was 2006 and nobody else wanted a log home. Even the log home dealers were closing one by one — the people who had been referring their buyers to us to build their homes. I had to lay off the crew. Our financial plan for retirement crashed and burned. We had arrived at retirement age still owing a mortgage. Reality was brutal: We could afford to own and maintain this property OR we could afford to travel. But not both. We had to choose one or the other. It looked as though our businesses had run their courses and we wouldn’t be needing so much space and so many resources — tools, machinery, etc. and the kids weren’t coming home to visit but once or twice a year. We were ready to downsize. We spent the next few years cleaning out sheds and closets and selling stuff or giving it away. We put the property up for sale. But we were in the middle of the recession and nothing happened. Finally, a neighbor showed up at our door asking if we would sell him 10 acres. We did, and then used the money to buy a used RV. We put the rest of our stuff in storage, put renters in the big house, and we hit the road. And the next year, while we were wandering around Alaska with our rig, the rest of our property sold. Our once impossible dream was becoming our new reality. We finally realized our dream of driving the Alaska Highway. Over the last couple of years, we have explored three corners of our country, from Florida to California to Alaska and a thousand points in between, and have moved offshore for a couple of winters living in the tropics in vacation rentals. New England (the fourth corner of our country) will have to wait for us, because we have decided to take a vacation from traveling (that sounds odd, maybe?) and move into a small apartment for a while. And we can finally afford to do BOTH. We can have a Michigan home base again AND continue to travel. Our new apartment is only 13 miles from our kids and grandkids, and the rent is less than half of what our old mortgage was! Somebody else mows the lawns, shovels the walks, and repairs the leaks… while I head down the rail trail with my bike or visit the local farm market or ice cream shop (One of the bike paths here ends at the local Dairy Queen). If I have one regret, it is that we didn’t start downsizing sooner. Fortunately, Kaye and I are still physically fit and able to pursue our travel goals, and we really do appreciate and take advantage of our good fortune. Lots of folks run out of good health before they ever get to realize their dreams. Anyway, I was doing a bit of reminiscing today and thinking about how far we have come in the face of a lot of challenges, and decided to write about it here. I am so happy that our present circumstance is so far different than where we were just a few years ago. If you, my reader, find yourself in a similar almost impossible scenario, take heart; there is much that can happen to improve your outlook and bring your dreams within reach. I suspect that your journey will begin with some difficult decisions and will be followed by a lot of hard work. That’s okay, isn’t it? The struggle makes the reward all the more satisfying. On the other hand, if you are in upsizing mode right now, it might be smart for you to stop and think about what you really want in 10 years or 20 years from now. Maybe you should quit bringing more stuff into your garage and basement and attic. It might turn into a ball and chain later and keep you planted at a time when you want to be free. Just a thought. Do what sounds right to you. Our list of reasons to leave the northern winters is a short list for good reason. Who needs more than a couple of good reasons to leave misery behind? Physical well-being. For many of us it goes beyond the discomfort of a chill running down your spine when the north wind blows. The lack of sunshine and the short days in Michigan in the wintertime have a noticeable debilitating effect on human beings that becomes even more bothersome as they age. Joint aches, muscle pain, and an overall lethargy that makes you want to go to bed right after supper all combine to make life dark and depressing. Not to mention that if you do actually venture outside for a walk or a trip to the store, you may well slip on the ice, split your head open and end up at the hospital for stitches. Winter is actually life-threatening for highway travelers, as indicated by traffic death statistics for the winter months. Every snow storm ends up being the last one for some unfortunate travelers as their car slides off the road and hits a tree. Emotional well-being. There is a reason why February is the month when the most suicides take place, and I am sure the long winter’s night of the soul has something to do with it. Cabin fever may sound entirely benign until it goes beyond restlessness and brings on bona fide depression and a sense of hopelessness. A feeling of being trapped in a dark place is not a healthful mental state for the human soul. There is a sense that you are wasting away while hunkering in a human hibernation mode until spring. Financial well-being. Winter can be expensive when you are paying to heat the house. You end up caught in a mental and emotional tug-of-war as you shiver while the thermostat is pinned at 65 degrees to save money. 75 would be a lot more comfortable, but the utility bills will rise exponentially. And the lights are on longer as the days are shorter, so the electric bill takes off as well. Instead of being out in the yard in the evening, you are sitting in front of the TV… and consuming even more electricity. And that means more popcorn and potato chips. That’s enough. Who needs more than 3 reasons to head south in the winter? Is self-preservation not enough? So What Do You Do With Yourself? Having escaped the northern winters and living as the proverbial snowbirds, we have been asked this question a few times. Those who have not retired yet wonder the same thing. What do we do to occupy our time? It is a question that no one can answer for you, because the answer rests entirely on your personality and interests and physical state. If you can’t think of something to do, maybe you shouldn’t retire. A former co-worker of mine is still teaching school in his 70’s because he can’t imagine what he will do with time on his hands. He says he will die teaching – and I believe him. Lots of folks will move to retirement communities that surround golf courses or marinas. That is perfect if you love golf or boats. For Kaye and me, having open spaces for walking and biking is important. We hope to stay physically active as long as we possibly can. As a photographer, I seldom land in a place that is without visual opportunity. When it does happen, I have always been able to find something within a short drive. 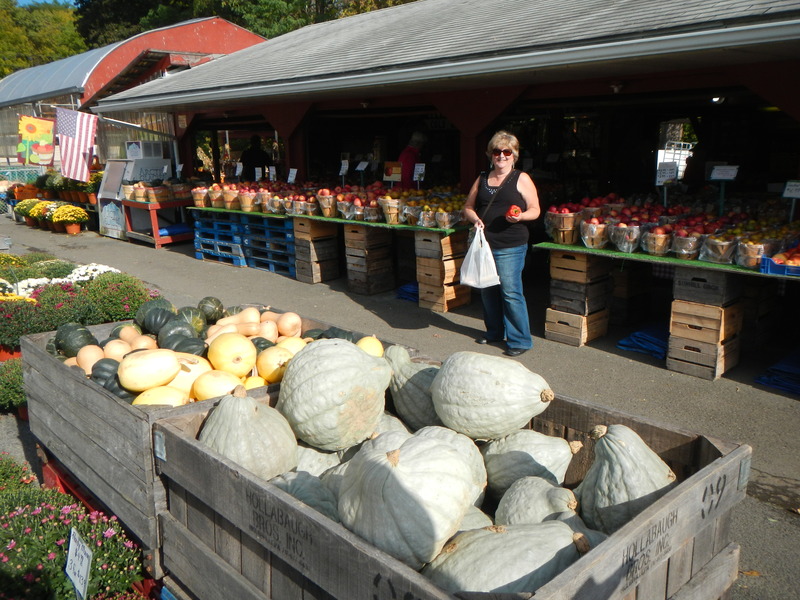 A short drive on the quad took me past this colorful farm market on the way to the beach. As a musician, I have been a little bit more frustrated as my piano is heavy and not very mobile and presents certain logistical challenges. Still, I have found ways to express my musical self in almost every place we have stayed. A couple of years ago I found a fellow musician who had set up a recording studio in a tent next to his motor home in a campground in Alabama. We collaberated on a song or two. Cool. This winter we flew to the tropics where we are renting a vacation house near the beach in a small fishing village. Our daily walks consist of sauntering downtown to the French bakery for a croissant or a pizza, or a short walk in the other direction to one of several palm-lined beaches. A swim in the ocean is always available – and the water is 80 degrees. In the apartment, we are able to stream movies to our laptops while lying on the bed or chatting with the kids and grandkids back home through social media or FaceTime. We read books that we download for Kindle. We journal about our adventures. Kaye and I are both actually writing books this winter. Adaptation is necessary for a successful migration in the wintertime, but every new place offers its own smorgasbord of opportunities. If boredom sets in, we look for ways to change things up a bit. And remind ourselves that at least we are not shivering in the northern snow and wondering how we will stay warm if the power goes off during a winter storm. And just so you know, we are not on vacation either. For us, this is life. *Lyrics from Jimmy Buffet’s song, Margaritaville. … or flexibility is the mother of invention… or flexibility is the spice of life. Or something like that. Anyway, for career wanderers, flexibility is an essential ingredient in keeping life moving along smoothly. The fact is, stuff happens, and sometimes the best laid plans of mice and men… get torpedoed. Our tentative plans for the next year are already laid out, but they are not written in stone. They can’t be. Because life happens, and things change. There are changes in the weather, there are changes in family plans. And mechanical repairs. We were planning to tour New England right now, virtually extending a trip to New York to deliver a load of furniture I had built for a customer there over this summer. I took the pickup in for a routine oil change… and ended up having the entire front end rebuilt when the technicians saw worn edges on the front tires. The work was scheduled for the following Saturday, the day we were to leave, and it extended into the next week as servicemen found more worn parts. The upshot was that we didn’t have time left for the planned excursion to the east coast, since we wanted to be back to Michigan for a rendezvous of all of our kids in one place at the same time (they have become quite the traveling vagabonds as well and don’t cross paths but a couple of times a year). So what do full-time adventurers do when their plans are destroyed? While checking the route to New York I had discovered some rugged features including box canyons and waterfalls not far from our drop-off point. Bingo! New adventure. As someone said lately, “Never waste a good fiasco.” Or when life hands you lemons, make lemonade. Or when life hands you grapes, don’t wine about it. 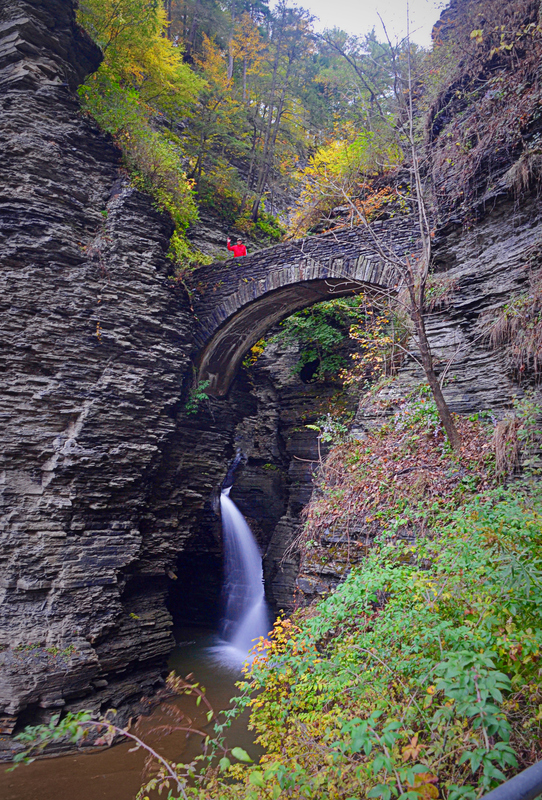 Anyway, we modified our plans and spent a couple of days climbing around the waterfalls at Watkins Glen, New York. I loved it. Maine coast, eat your heart out. We will get to you another time when we have the time – and a red convertible – to do it properly. 50 states will wait for us. We are stuck for the time being at 43. And that is fine. 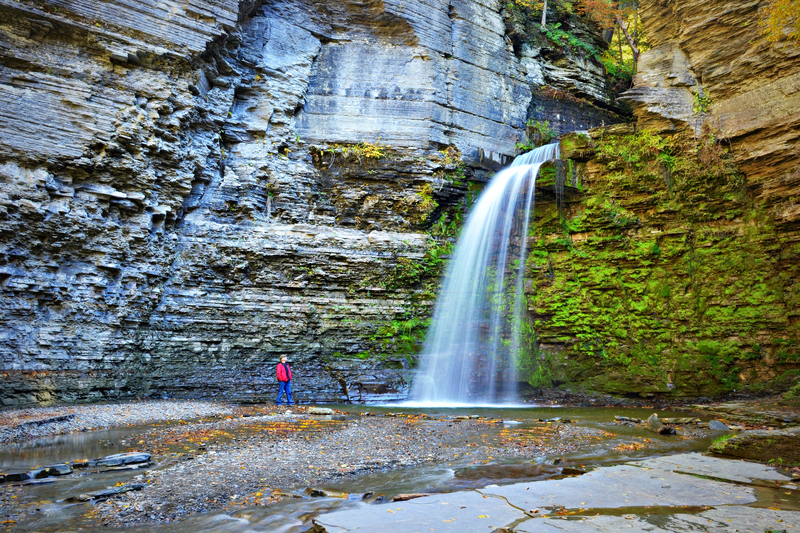 Here are some photos I shot while exploring the canyons of western New York. 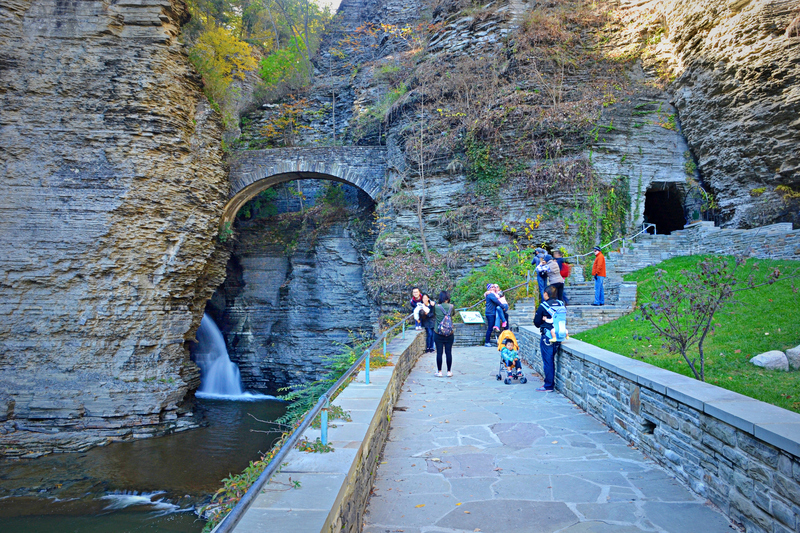 Visitors enter Watkins Glen through a tunnel (right) and stairways leading to the first of several stone bridges. 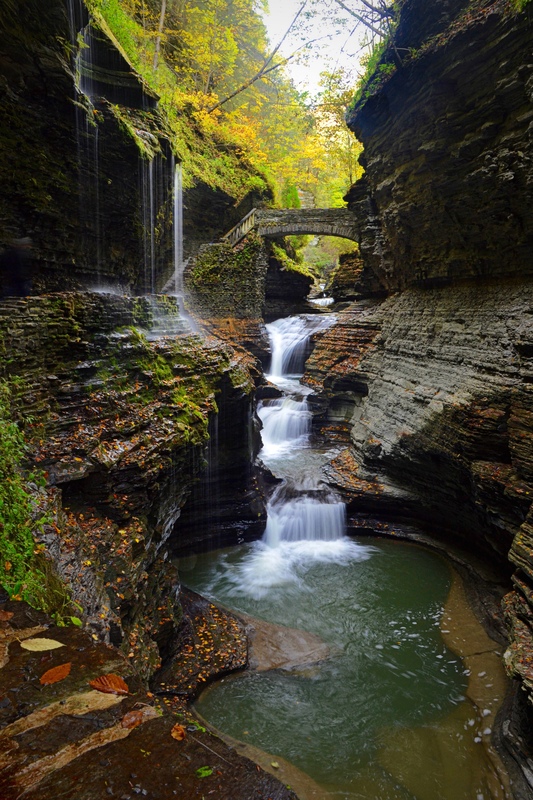 The first bridge spans the gorge over the first of 19 waterfalls and cascades. Rainbow Falls has a magical quality that adds to the overall mystique of the canyon. 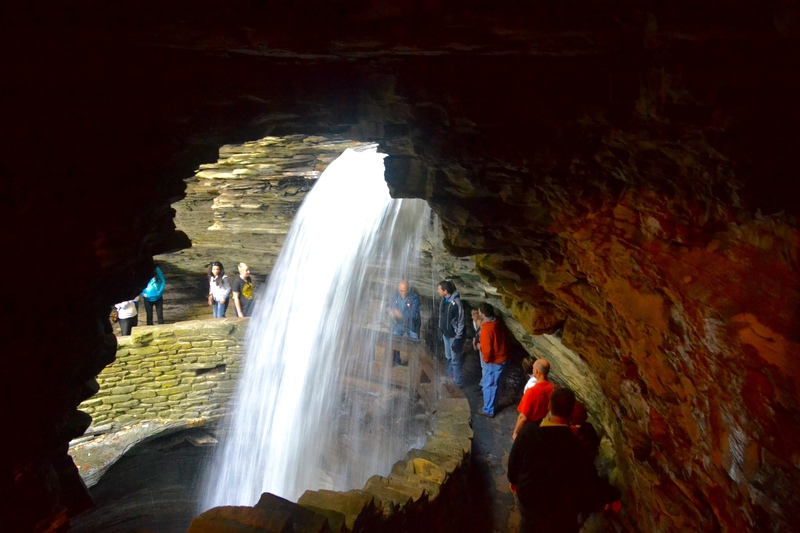 The trail leads behind this waterfall, then into a vertical tunnel with a spiral stairs inside the cliff. Eagle Cliff Falls was easily accessible after a short hike and a few steps. Warmer weather would have definitely precipitated a spontaneous shower under the torrent! The Finger Lakes region of New York is wine and fruit country; roadside fruit markets abound. Anyway, if variety is the spice of life ( and to full-time adventurers it really is), then flexibility is the mother of invention. It results in the invention of the next side trip… and more adventure. All 50 States. How Hard to Try…. Milepost 10-6-15 Cedar Springs Michigan. Parked in our daughter’s yard. Today Kaye and I are leaving for New England on a spontaneous quest to add 6 more states to our collection for a total of 49 – leaving only Hawaii unvisited. We really did not have this on our bucket list until coming home from the south last spring. We had added several new ones while wandering across the south during the winter from Louisiana east to Florida and then north along the Atlantic coast heading back home in the spring. At some point along there it occurred to us that we were actually unintentionally tallying an impressive inventory of states visited. By the time we turned west from the eastern seaboard we decided to make it a thing, and we would have to be really intentional about Delaware or we would miss it entirely. It wasn’t on the way to anywhere else like most of the states we had visited. We were camping near Washington D. C. and decided to make a quick day trip to score Delaware. Now we are heading off to New York to deliver a trailer load of custom-built rustic furniture that I assembled during the summer for a client that I had built stuff for a few years ago. And we have time to continue on to New England and visit the last six of the continental United States. Maybe we will even see some fall color. Visiting all 50 states was not a thing for us until we realized we were well on our way to doing it just by chance. Just by being travelers all of our lives. Actually, two of our three daughters have already visited all 50 and they got their impressive start while riding in the back seat as kids while we explored the country as a family with a van and a tent years ago (photo at top shows our stop at the Tetons in 1991). 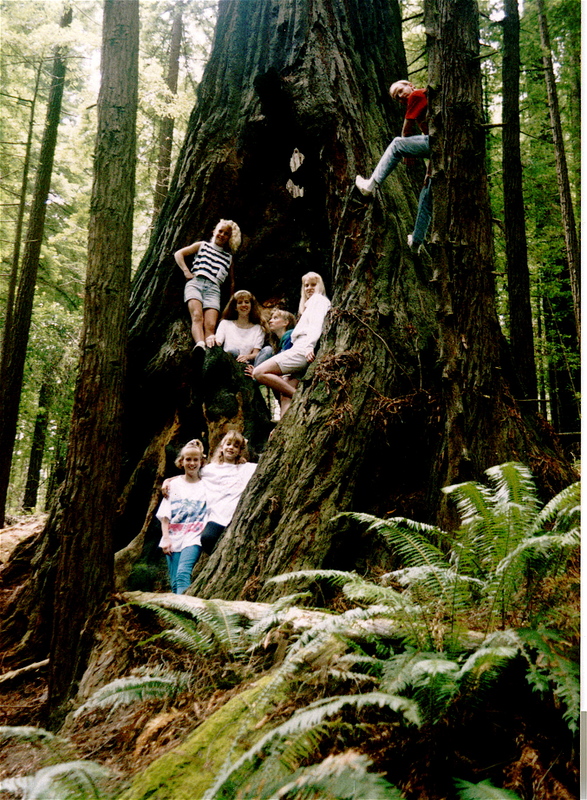 Our kids – with some of their cousins – inside a giant redwood tree in northern California. I am not sure what we will do about Hawaii. If it really is a thing for us, we will probably have to make it happen sometime. So is it a thing or not? I don’t know. If I have to choose, I might rather continue east and do Italy (one of my daughters is there with a friend right now). Time will tell. Meantime, watch for a report from the coast of Maine in the next few days. See ya! Postscript: We had mechanical trouble that prevented us from making the New England trip. Instead, we spent time in a service garage. We did get our shipment delivered to our client in New York, but our tour of the northeast will have to wait. Lighthouse Duty Is A Tall Order. 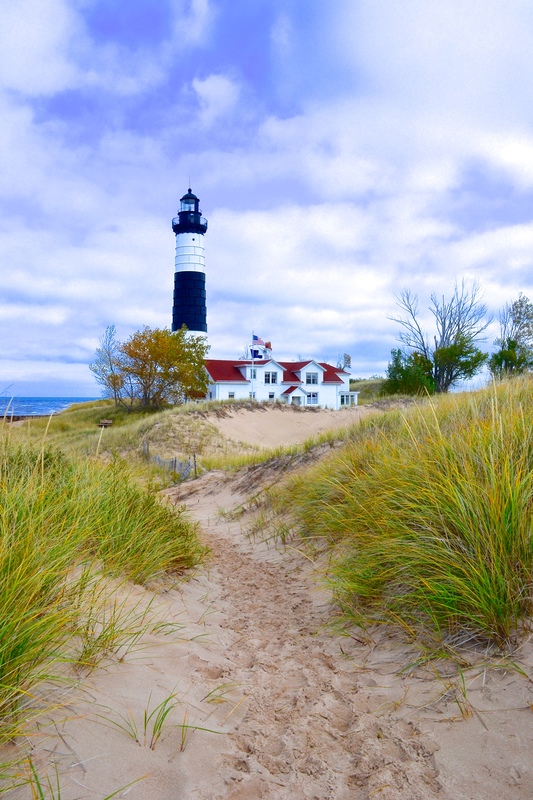 Our long-awaited engagement at the Big Sable Point Lighthouse at Ludington, Michigan is upon us, and there are a couple of notices I need to post for those who might want to visit while we are there. 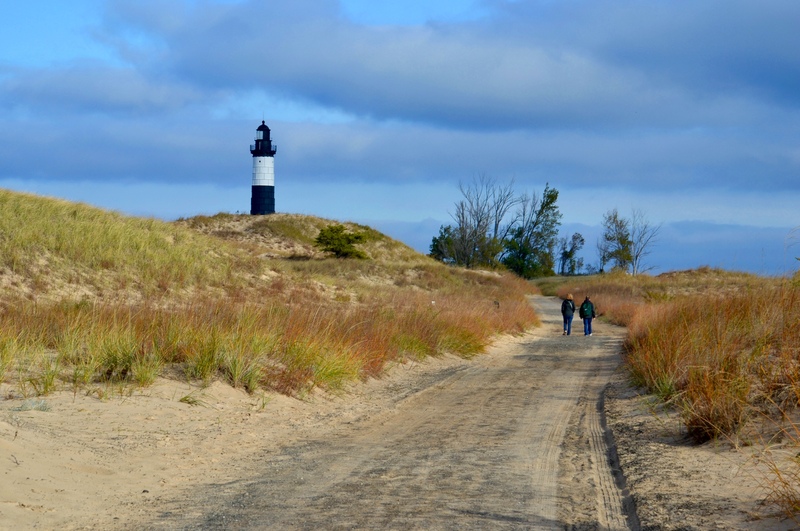 The first is that this is a remote location that is only accessible via a 1.8-mile trail through the dunes from the visitor center at Ludington State Park. It may be a difficult hike for those who are not used to that much physical exertion (at least it is not hilly). And then there is the lighthouse tower with its 130 steps if you want to climb to the top. Then, of course, the return walk to the car. The lighthouse stands at the end of a sandy service lane through the dunes. The second thing to be noted is the hours of operation. The lighthouse and museum and gift shop are open from 10 am to 5 pm daily. The surrounding grounds – mostly sand dunes and lakeshore – are open all the time. There is a small fee for entry into the state park unless you have the Michigan Passport license plate. Trailhead parking is immediately inside the park entrance. The cost to climb the tower is $5 for adults and $2 for kids twelve and under. Kids must be 40 inches tall to climb the tower. Kaye and I will be arriving at the lighthouse for our tour of duty on September 14th after 5 pm, and leaving on the 28th. We will stay in the original keeper’s house which is attached to the lighthouse and be working alongside four other volunteers, taking turns in the gift shop, the museum and the lantern room at the top of the tower. I plan to post reports and photos of our activities while at the light whenever I have access to wireless services, so stay tuned. We arrived on Monday and settled in at our upstairs bedroom in the 150-year-old light keepers’ house along with the other volunteers. The weather has been sunny and very windy every day so far. Kaye and I take turns with the others, running the till in the gift shop, answering questions about the history of the lighthouse in the little museum, and keeping visitors safe on the tower platform 100 feet above the Lake Michigan beach. We also rotate in the kitchen, preparing the evening meal for the group. Today I baked pizzas from scratch and they were accepted with delight. Skies have been totally clear the last 3 nights and I have had a chance to attempt night sky photography, something I have been hoping to try for some time but haven’t been in a dark enough location. Though we are 9 miles from the nearest town, this is still not the best scenario, since the light on the ground tends to overpower the Milky Way. Wish I could find how to turn off those amber yard lights next to the building. Here’s a sample of my first attempt. 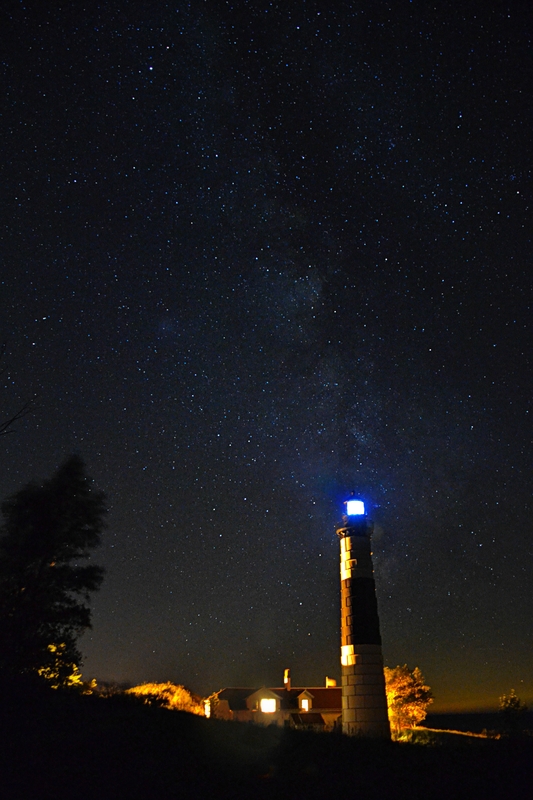 The Milky Way hangs above the 100-foot lighthouse at Big Sable Point, Ludington, Michigan.